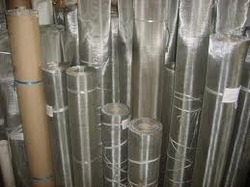 Offering you a complete choice of products which include spot mesh, knitted steel mesh tube, galvanized flat wire mesh, wall frame stainless steel weld mesh, welded mesh and flattened galvanised mesh. 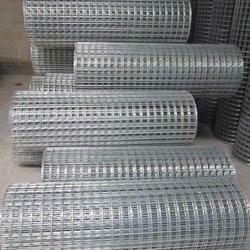 WE ARE THE MANUFACTURER OF SPOT MESH IN VARIOUS GRADES SS 304, SS 316, SS 202, GALVANISED. WE HAVE A WIDE RANGE OF READY SIZES IN STOCK WE ALSO MANUFACTURE CUSTOMISED SIZES AS PER CLIENTS REQUIREMENT. 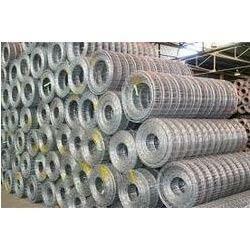 We are involved in offering an excellent quality range of Welded Mesh in the market. Our product is made from quality approved raw materials with the assistance of the best industry professionals. Our range of this product is highly demanded among the clients. Moreover, these products are tested against several quality parameters to ensure their unmatched quality and excellent finish. These products are used in horticulture industry as tree guards and plant protection. Our offered assortment of this product is available at market most reasonable and competitive prices. 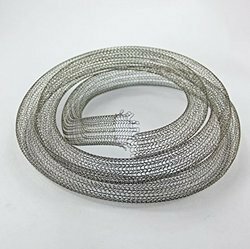 With the help of experienced and skilled professionals, we are offering to our valuable clients a wide array of Stainless Steel Wire Mesh that are demanded among the clients to meet their requirements. These products are made from quality approved basic material. They are quality tested in nature and are delivered in well-defined time frame. Our entire product range is available at most reasonable rates. Often referred to as "18-8" ( 18% chromium, 8% nickel ) T-304 is the basic stainless alloy mostly commonly utilized for wire cloth weaving. It withstands outdoor exposure without rusting and resists oxidation at an elevated temperature up to 1400 Degrees Fahrenheit. Typical wire cloth applications include use with chemicals, food products, pharmaceuticals and exposure to moisture. Stabilized by the addition of 2% molydbenum, T-316 is an "18-8" alloy. Type 316 has better resistance to pitting corrosion than the other chromium-nickel stainless steels where brines, sulphur-bearing water or halogen salts, such as chlorides are present. A valuable property of T-316 is high creep strength at elevated temperatures. Other mechanical properties and fabricating characteristics are similar to T-304. 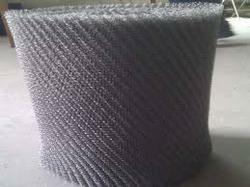 Wire cloth woven of T-316 has extensive use in chemical processing when better corrosion resistance is required than the regular chromium-nickel types. Type 316 L is very similar to T-316, the difference being the reduced carbon content for better wire cloth weaving and secondary welding characteristics. 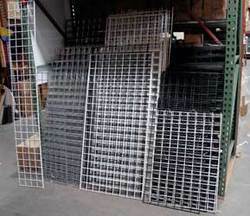 With the precise knowledge and expertise of the relevant industry, we introduce ourselves as a leading organizations in offering Knitted Wire Mesh that can be available in different dimensions and sizes. The offered assortment of product is designed and developed by experienced professionals in various attractive designs and dimensions to cater clients' specific requirements. Apart from this, our offered product is highly admired by our valued clients for its salient features and cost effectiveness. 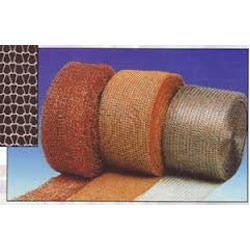 Abrasive copper mesh for cleaning plastic extrusion screws, barrels, dies, moulds .